The momentum of cross-border investment from Asian countries such as China, Japan, and Korea continues to grow. China has picked up steam in overseas M&A with $122.57 billion in deal value in just the first half of 2016, shattering its record and surpassing that of the US and Germany. The LSN team regularly travels to major innovation hubs in North America, from Boston and San Francisco to Houston and Toronto. Everywhere we go, we are seeing a growing number of Asian investors and corporations in search of innovative healthcare products. The healthcare sector has become increasingly attractive for its long-term growth as well as solutions to the buyer’s domestic unmet medical needs. The cross-border investment scene not only has seen quantitative changes, but qualitative ones. A decade ago, only a small number of state-owned entities or large corporations went outbound to acquire strategic resources. In recent years, the arena has been filled by publicly traded or private-owned companies . The changing landscape reflects a new mindset that views overseas activities as a part of regular business strategy. As the diversity of buyers increases, so does the scope of their investment. 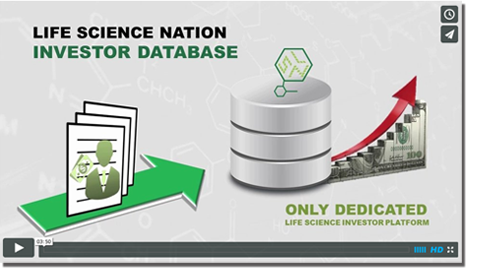 Backed by highly trained workforce and ‘returnee’ scientists, Asian biopharma industry has demonstrated strong ambition in innovation. Instead of focusing on snatching mature businesses, Asian biopharma companies are now active in swapping assets with their US and West European counterparts. 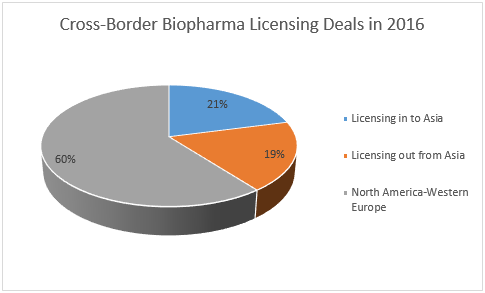 According to LSN Licensing Deals Platform, Asia accounts for 40 percent of all global cross-border biopharma licensing deals from January to August this year (see Figure 1). What does it all mean for early-stage entrepreneurs? For US- and Europe-based businesses, Asia may present as a potential funding source. However, effective collaboration would never happen if you do not have thorough understanding of how your product fits into a different patient population, healthcare environment, distribution channels, and regulatory system. Though stories of cultural clash are sometimes heard, one cannot deny that a trustworthy and experienced Asia partner can be of great help with navigating the uncharted waters and avoiding unforeseeable pitfalls. To build any business relationship, physical interaction is a critical first step, which is especially true in the Asian business cultures. For entrepreneurs with an Asia strategy, they should strive to grab every chance to get in-person time with potential Asia partners.